About This Record. 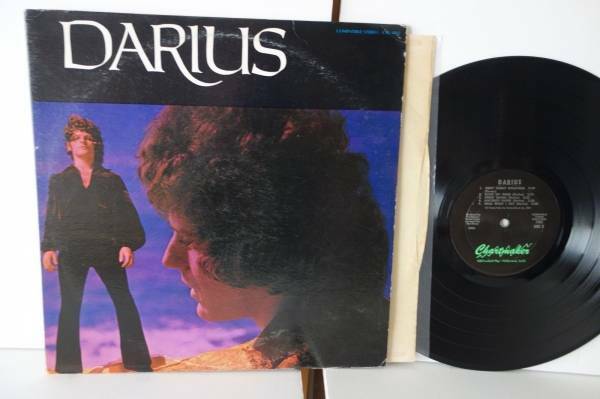 This is an original USA copy of Darius same titled LP from 1969 on Chartmaker Records. This is a top keeper copy of a really cool psych LP that just never turns up. Even Hans Pokora likes it and gives it 3 stars in his 1001 book, but I bet hewould give it more stars now! Goodluck, No Reserve. Please see the details below about the cover, vinyl, labels andeverythingelse you might want to know. PLEASE CHECK my Feedback which will show you my grading, Cover/Vinyl, of other 45rpms and LPs I have recently sold and what the lucky people who bought them think of them and our experience. The photos of the labels or cover list the songs and any possible details about the labels. I offer full refund including shipping both ways (for USA and foreign buyers in case for some wildly strange reason you might be unhappy with this purchase). Comes cleaned on my KL Audio Ultrasonic Record Cleaner and placed in a new dust-free sleeve for your grandchildren. And at least one plastic sleeves for moisture protection (for you and me). Cover Condition: The cover is in nice Excellent Minus (EX-) condition. It has corner rubs, corner ding top right, a small ding in the spine, and the spine like the seams has no splits! Very nice copy.Please see all my Photos. I didn't take them for fun and frolic. Vinyl Condition: Excellent (EX) Top keeper copy. There are 2 -3 light meaning less marks on each side. One side has a mark thatgoesacross most of the Vinyl, but it is light and does not sound. Play tested, as this like all my records is from my personal collection. I am not a Dealer. Labels. Near Mint (NM) labels.Please see photos of all labels. Inserts: Comes with original plain white (Now brownish) plain paperinner sleeve. Packaging. I clean all vinyl on my KL Audio Ultrasonic Record Cleaning Machine and place it in a new innersleeve so the old dust does not reattach; but I also include the innersleeve that came with the LP if it is the original. I separate the vinyl in its new sleeve after cleaning from the cover, and place the cover and the separately packed vinyl in at least one if not two plastic innersleeves that help protect against moisture damage during this cool records transition to your record collection. I use sturdy carboard containers with real corners and pack with at least two insert stiffeners, and I place neon stickers on the front and back of the package indicating “Do Not Bend” and/or “Fragile” or something like that to help facilitate a safe passage. Shipping and Payment. PayPal only. I ship promptly worldwide; sometimes the automatic eBay invoice does not have accurate shipping if you buy more than one LP, so if you are unsure email me and ask for an invoice. . . . I offer full refund on this record including shipping both ways, unless you live outside North America in which case I will refund you shipping one way unless I made a mistake which I sometimes do because I am only human.. CALIFORNIA RESIDENTS: Please add sales tax!